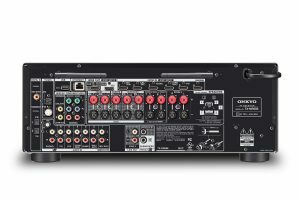 Onkyo has announced another two 7.2-channel network A/V receivers to add to its portfolio of price competitive home theater boxes. Both the TX-NR686 – which includes THX Select certification – and the TX-NR585, come in at MSRPs of $649 and $549 ($899.99 and 749.99 CAN), respectively. Both receivers include multi-room technologies, 4K video support and 7.2-channel surround capabilities. The TX-NR686 is a 210 W/Ch (6 ohms, 1 kHz, 10% THD,1-channel driven) is THX® Certified Select ensuring ‘theater reference level’ performance in your home. To gain certification, amplifiers must pass severe THX bench-tests covering multiple aspects of audio performance. Meanwhile, the TX-NR585 pushes 170 W/Ch (6 ohms, 1 kHz, 10% THD, 1 channel driven) and is promoted by Onkyo as ideal for first-time buyers. 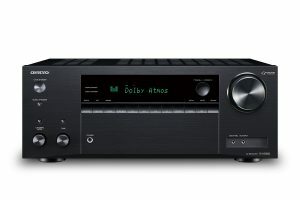 Not surprisingly, both products will handle DTS:X and Dolby Atmos soundtracks, and the receivers carry DTS Neural:X and Dolby Surround up-mixing. Each is cross-compatible with legacy sound formats encoded on Blu-ray and DVD, such as Dolby TrueHD and DTS-HD Master Audio. AccuEQ Room Acoustic Calibration, which sets speaker conditions for optimal performance tailored to the listening space, is enhanced by AccuReflex™ technology. AccuReflex assures cohesive sound at the listening position by phase-matching directional and non-directional sound for soundtracks played though Dolby Atmos-enabled speaker systems. Audio playback includes high-current drive, non-phase-shift amplification circuitry and discrete output stages in both receivers. The combination of high current and power results in ‘thrilling dynamic performance,’ according to Onkyo. Digital audio sources, such as Hi-Res Audio in 5.6 MHz DSD or 192 kHz/24-bit in FLAC, WAV, AIFF, and ALAC over network or USB input, benefit from VLSC (Vector Linear Shaping Circuitry) on the Front L/R channels. The patented circuit removes high-frequency noise for clear articulation of the above-mentioned formats. Streaming services such as Amazon Music, TIDAL, TuneIn, Deezer, Pandora and Spotify are built into the receiver to make selection easy from remote control or Onkyo Controller or Onkyo Music Control App. All network streaming and control functions, including AirPlay, operate over dual-band 5 GHz/2.4 GHz Wi-Fi for stability in areas with household network congestion. Music streaming capabilities are further bolstered with built-in Bluetooth wireless technology. Both the TX-NR686 and the TX-NR585 feature DTS Play-Fi tech, which enables streaming services to be synchronized across single or grouped rooms via the Onkyo Music Control App. Multi-room audio support over Wi-Fi extends to Chromecast built-in, enabling users to stream music from smartphones, tablets, laptops, and PCs from popular apps, while voice control with the Google Assistant is available through Android phones, iPhone, Google Home, or other compatible devices. FlareConnect is also onboard to allow the A/V receivers and compatible audio systems and speakers to freely share analog and digital sources between each other, with playback managed via Onkyo Controller. Users can repurpose a set of stereo speakers in the kitchen, garage, or other interior space by powering them via ZONE 2 speaker outputs, with no extra amps or players required, while retaining a 5.2-ch home cinema in the main room. As well as analog sources including phono and tuner, powered ZONE 2 employs a DAC to distribute digital input sources (network, USB, and S/PDIF) for simultaneous playback of the same or different sources in either or both rooms. Zone 2 line-output is ideal for sharing content to a hi-fi system featuring a line-level input, with multi-room playback management courtesy of Onkyo Controller. HDCP 2.2-compatible HDMI inputs, Main Out, and Sub Out (Sub Out only for TX-NR686) pass 4K/60p video as well as BT.2020 color standard, 4:4:4 color sub-sampling, and High Dynamic Range in HDR10, HLG, and Dolby Vision formats to a compatible TV display or projector. The TX-NR686’s front HDMI input can be used for temporary device connections, such as a video recorder or game console. Both units include a Graphical User Interface (GUI) over HDMI, which Onkyo believes is very simple to navigate. I am certainly no expert; but, 10% THD seems awfully high. Could that be a misprint? Exactly as it comes from the horse's mouth, and re-confirmed on the http://www.onkyousa.com website.